The 7I70 is a remote isolated 48 input card. The 7I70 inputs sense positive inputs relative to a common field ground. Input impedance is 10K Ohms and input voltage can range from 5VDC to 32VDC. All inputs have LED status indicators. The input common field ground is galvanically isolated from the communications link. 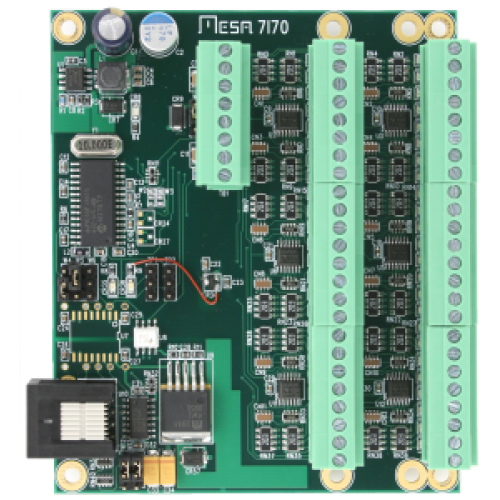 The 7I70 uses field power of 5VDC to 32VDC and sets its default input threshhold to 50% of field power supply voltage with 10% hysteresis for noise immunity. Inputs can be programmed to other thresholds and filtering can be added if desired. In addition to the being able to read digital on/off status of each input, all input pin voltages are readable with 8 bit resolution. The RS-422 interface at 2.5 MBaud is compatible with HostMot2s SSLBP smart serial interface which can support as many as 32 7I70 cards for a total of 1536 inputs with real time update rates up to 10 KHz. 3.5 mm screw pluggable screw terminals are used for all isolated I/O.